Using IS-2062 Grade A, En-8, En-19, SS-410, SS-304, SS-316 or any other material as per the specification of the customer. As per IS-1367 Class 5.6, Class 8.8, Class 10.9, Class12.9, ASTM A193 B7, ASTM A193 B8, B8M, B16, ASTM A563 L7, L7M. Surface Treatment: Blackodised, Phosphated, Zinc Plated with yellow, blue, olive green passivation. Full Thread Studs as per DIN 975. Rods with Threading on one side as per DIN 524. Studs with Threading on two sides as per DIN 939, DIN 940, IS 1862 Type A, B & C.
Tie Rod Studs for Plate Type Heat Exchangers. 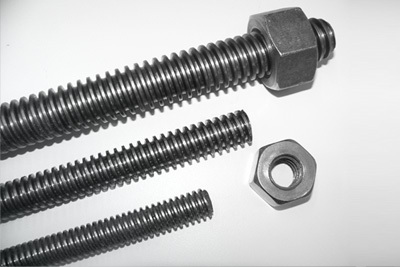 Square / ACME Thread Studs (Lead Screws). Other Studs as per your specific requirement and drawing.